Lots of candidates, real politics in Iran. This is the first in a series of posts about Iran’s crucial presidential election on June 14. If Iran is a dictatorship, its politics is remarkably rough and tumble. Not only does the coming presidential election look like it might well be wide open and contentious, but it could have a lot to do with whether or not talks between Iran and the P5+1 world powers will be successful when they resume. As I’ve been writing for more than a year now, the talks with Iran have been largely frozen because both the United States and Iran were engaged in crucial presidential votes. To be successful, both sides will have to make significant concessions to the other—and thus to pay a political price at home, where hardliners in both countries will oppose any deal that’s half-a-loaf. That’s still hard, but with both elections out of the way maybe the roadblocks can be bulldozed. As the June 14 election draws closer, a vast array of would-be candidates has registered to run. In a few days, the Guardian Council—the body in Iran that vets candidates for, among other things, their commitment to Islamic piety and to the Islamic Republic itself—will decide which of those will be approved to run for president, giving the candidates just a few short weeks to make their case. In one sense, of course, that’s hardly democratic, since the Guardian Council would instantly bar anyone who doesn’t fit its preconceived standards from running—and that almost certainly includes women, a number of whom have filed for candidacy, along with anyone who’d overtly challenge Supreme Leader Ayatollah Ali Khamenei. And, of course, Khamenei wields near-total power over the council, six of whose twelve members are appointed by Khamenei and the rest by Iran’s judicial authority, whose leader is also a Khamenei appointee. Still, for a political system like Iran’s, the major candidates who’ve emerged so far represent a broad range of Iran’s establishment. One of them, Esfandiar Rahim Mashaei, a top aide to President Mahmoud Ahmadinejad, has carved out a position that leans more nationalist than Islamist, and he’s emerged as a favorite even for some of the Green Movement’s partisans because both he and Ahmadinejad have challenged the clergy’s power. Both Ahmadinejad and Mashaei appear to be seeking an independent political power base within Iran’s system, and there has been speculation that the two men might be trying to emulate Vladimir Putin and Dmitry Medvedev’s move in Russia, who repeatedly switched jobs as president. Ahmadinejad, who cannot run in 2013 for a third term, has fallen out of favor with Khamenei and the conservative clergy, including Ayatollah Mesbah-Yazdi, who had been Ahmadinejad’s chief clerical backer and purported mentor in 2009. It’s far from certain that Khamenei and the Guardian Council will allow Mashaei to run. Iranian conservatives frequently attack the Ahmadinejad-Mashaei group, several of whose allies have been either arrested or ousted from their government positions since 2009, as the “deviant current,” and they’ve been accused of witchcraft, sorcery and worse. One of the sins allegedly committed by Ahmadinejad and Mashaei has been to imply that they are in direct, spiritual communication with the Mahdi, a mystical descendant of the Prophet Mohammad who, many Shiites believe, went into “occultation” centuries ago. The political implications of Ahmadinejad’s link to the Mahdi is that he short-circuits the clergy itself, whose ayatollahs claim that mantle of mediator between their followers and the Mahdi. In any case, were Mashaei to be ruled ineligible to run, it could trigger a political crisis, especially if President Ahmadinejad sought in retaliation to postpone the election. Another candidate—who also might be declared ineligible—is Ali Akbar Hashemi Rafsanjani, the former president (1989-1997). Like Mashaei, Rafsanjani didn’t register as a would-be candidate until the very last moment. He said that he wouldn’t announce his candidacy unless Ayatollah Khamenei gave permission, and although there is no overt sign that Khamenei did so, Rafsanjani’s family and others are hinting that the former president received a last-minute phone call from Khamenei giving him the okay. In different ways, both Ahmadinejad-Mashaei and Rafsanjani are relative “doves” on the nuclear issue, however. In early talks with the Obama administration in late 2009, Ahmadinejad seemed to endorse an interim deal over Iran’s 20-percent-enriched uranium that was later scuttled by his domestic political opposition, presumably with the backing of Khamenei. And Rafsanjani, who is closely allied with wealthy businessmen and the bazaar leaders who resent Western sanctions against Iran, would dearly like to get the nuclear issue out of the way so that the Iranian economy could be freed of the shackles imposed by the sanctions, which have badly hurt the Iranian oil and energy, high-tech, aviation, and automobile industries, among others. It’s almost inconceivable that Khamenei will make concessions to the United States and the P5+1 without getting major concessions in return, and so far the Obama administration has not been willing to offer those. 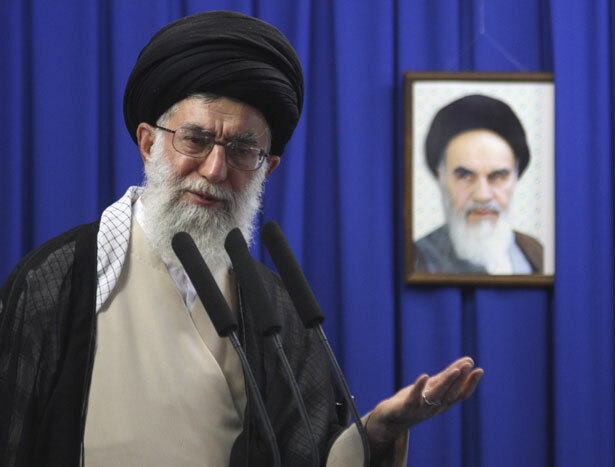 In that sense, by supporting Jalili—who is well known to American officials and others—Khamenei could underline his refusal to sign off on any deal that doesn’t allow Iran to continue a carefully monitored civilian nuclear program, including enrichment of uranium. By the same token, none of the other candidates are likely to do so, either. Finally, one interesting candidate—who, also, may or not be approved by the Guardian Council—is Hassan Rouhani, a long-time Iranian national security official. Like Jalili, Rouhani also was Iran’s chief negotiator on the nuclear issue, with Khamenei’s support, but under the regime of President Khatami. In addition, however, Rouhani is close to Rafsanjani, under whom he served on Iran’s national security council in the 1990s, and it’s possible that either Rouhani or Rafsanjani could step back and support the other’s candidacy. Indeed, Rafsanjani’s son and daughter prominently attended Rouhani’s announcement of his candidacy last month. There’s a lot more to say about Iran’s election and its implications for U.S.-Iran relations, and there are plenty of other candidates—including powerful conservatives, such as the mayor of Tehran—who have thrown their hats and turbans into the ring. But let it not be said that Iran doesn’t have a vibrant political debate. In 2009, that debate spilled over into the street following what many thought was the fraudulent reelection of Ahmadinejad. But if anything, there are more and greater contrasts today between those seeking to run for president than before. Does it have meaning for the talks with the P5+1 over the nuclear issue? Yes. Not only do the potential candidates have differing approaches, I suspect, but the election itself might say something about Khamenei’s own views about Iran’s future relations with the West. We’ll see. If the Guardian Council bars Rafsanjani, Mashaei, Rouhani, and others and endorses only strict, “principlist” conservatives as candidates, it could signal that Khamenei won’t give an inch in the talks. If the council lets a hundred flowers bloom, or at least a handful or so—and there are hints that as many as ten candidates might win approval—then perhaps it’s a tea leaf signaling that Khamenei will have a little more give later this year when talks resume in earnest. Read Bob Dreyfuss on the latest possibilities for peace talks on Syria.